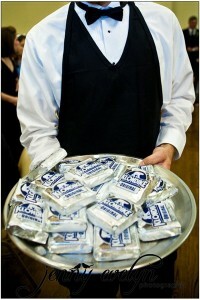 A PLATTER FULL OF KLONDIKE BARS! No seriously. I love this. I mean, it’s brilliant in its simplicity (and you know I love simple brilliance) and I bet it perfectly captured the groom’s tastes and personality. This adorable photo was captured by Jenny Evelyn Photo.